Beavercreek sophomore Isaiah Moore drives in for a layup against the Springfield defense. 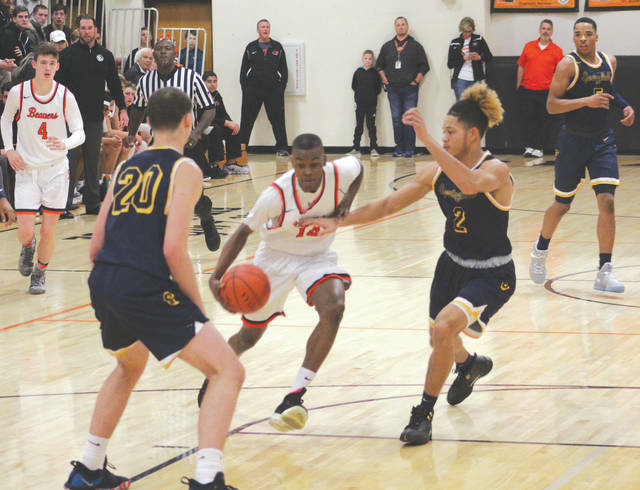 BEAVERCREEK — The Beavercreek High School boys basketball team went through some ups and downs in their opening game Nov. 30 against Springfield. The team had some really strong moments, but there were also long droughts as well resulting in a loss by a score of 43-68. The Beavers (0-1) had six guys playing in their first varsity game. Their inexperience was seen in this game through some simple mistakes such as having a pass go through their hands or missing a close shot. Hess said he hopes to help his team get some more consistency going forward. The team started off slow giving Springfield a nine-point lead before scoring their first basket. There were stretches where Beavercreek would start to catch up, but the Beavers also had multiple good looks that they just were unable to convert on, and gave up stretches where Springfield easily scored in transition. Hess said fixing the small errors will come with more practice and experience. Chris Herbort led the Beavers with 18 points. “We knew there would be some growing pains but they will get ready and get better going forward,” Hess said. Beavercreek will play its next game at home at 7:30 p.m. on Tuesday Dec. 4 against Xenia. Joshua Woolverton is a student intern for Greene County News from Cedarville University.